The Wheel of Time turns and Ages come and go, leaving memories that become legend. Legend fades to myth, and even myth is long forgotten when the Age that gave it birth returns again. In the Third Age, an Age of Prophecy, the World and Time themselves hang in the balance. What was, what will be, and what is, may yet fall under the Shadow. "Jordan is able to take ... familiar elements and make them his own, in a powerful novel of wide and complex scope. Open religious and political conflicts add a gritty realism, while the cities and courts provide plenty of drama and splendor. Women have a stronger role than in Tolkien.... Each character in this large cast remains distinct.... Their adventures are varied, and exciting.... "The Eye of the World" stands alone as a fantasy epic." --"Locus" "Robert Jordan has created a fantasy world as tangible and credible as history. He has a fine eye for detail and a vivid sense of drama." 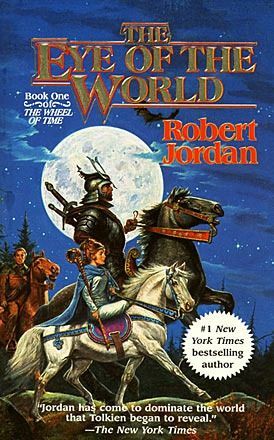 --Morgan Llewelyn "Robert Jordan's "The Eye of the World" proves that there's still plenty of life in the ancient tradition of epic fantasy. Jordan has a powerful vision of good and evil-- but what strikes me as most pleasurable about "The Eye of the World" is all the fascinating people moving through a rich and interesting world." --Orson Scott Card "Jordan's world is rich in detail and his plot is rich in incident. Impressive work, and highly recommended." --"ALA Booklist"